Thursday night, one of the hottest neighborhoods in Chicago just got a little hotter. A new boutique, Mod + Ethico opened at 29 N. Morgan in the West Loop and we were lucky enough to be invited to the launch party. I first met the owner, Candice Stewart, at Dose Market. Dose Market is a pop-up that curates all local "makers, bakers, chefs, designers and artists" in one place. Almost all of the items at Dose are Made in the USA and more specifically, Made in Chicago. Candice has strong ties to Made in the USA and ethical fashion, two things that are very near and dear to my heart. She grew up in West Virginia and spent time working in her Mom's gift shop where she learned to "appreciate where items were made and how the materials were sourced". About 90% of her merchandise is designed and manufactured in the United States. The emerging designers that Candice features in her boutique all "share her vision for a better future for fashion and meet one or more of these standards: made in the U.S.A., fair-trade practices, eco-friendly materials and small scale production". It was a delight to see the store was packed for the launch and that Candice was too busy ringing out sales to even mingle! Many of the designers featured at Mod +Ethico are favorites of mine, including Splendid LA, Drew Clothing, Riller & Fount, California Tailor, GoldSheep Clothing, GoodhYOUman, Vintage Havana, Little River Sock Mill and Nation Ltd. I was also introduced to some new brands-which is always a bonus! 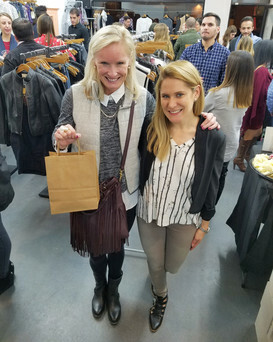 An eco-friendly leather coat by Production Mode, who designs and manufactures in Chicago, caught my eye along with some stylish separates by designer, Suki & Solaine, who was also in attendance to the event. The new company, Clear Coated Rainwear, makes see-through rain coats in Seattle. What a perfect way to show off your American Made Style even when it's raining! Rounding out the American-Made designers featured at Mod + Ethico were MapTote, Holly & Tanager handbags and Coat Check Chicago. We wish the best of luck to Candice and commend her on all she is doing to raise awareness and educate the consumer. We can not underestimate the power the consumer has with every purchase that is made. According to the Million Jobs Project, if Americans spent just 5% on American Made products it would produce 1 million jobs. Now factor in that you are not only supporting the economy and jobs but also ethical manufacturing standards, fair wages and eco-friendly production. Will you join us to #buyAmerican, be #labelconscioUS, support #BackyardEconomics and Go the Extra Mile for American Made Style? Items purchased at Mod + Ethico: Little River Sock Mill, Nux ActiveWear, GoodhYOUman.